Milwaukee's Irish community invites you to visit the Irish Cultural and Heritage Center (ICHC) located in the landmark Grand Avenue Congregational Church building just west of downtown. This impressive Edward Townsend Mix limestone structure retains almost all of the original features from its construction in the 1880s. It now is the home of a wide range of cultural and educational programs and the site for concerts, lectures, art exhibits, dances, Irish music classes, and a center for genealogical research. 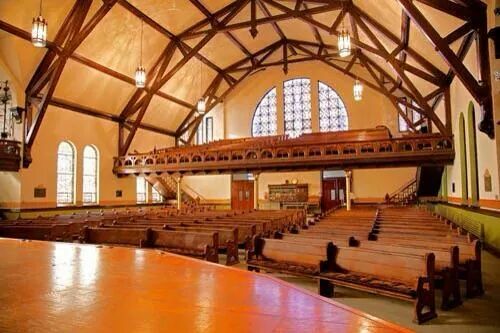 The halls and parlors of the ICHC are available for rent by individuals or organizations. The Irish Cultural and Heritage Center supports the Irish Community by serving as a venue dedicated to enhancing, promoting and preserving Irish culture and heritage, and serving the community at large. Unfortunately, our beautiful building is showing its age. This is where you come in. You can help us maintain this historic gem so that everyone can continue to enjoy it. Please consider giving whatever you can. Even a $25 donation makes a BIG difference!